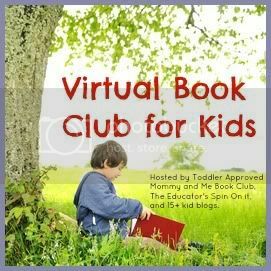 This month the Virtual Book Club for Kids is featuring Marcus Pfister. 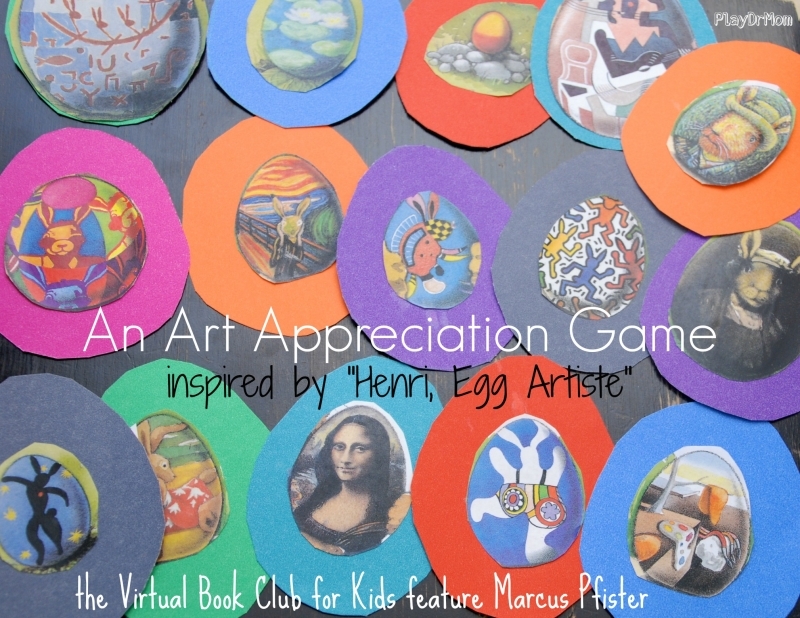 The kids and I had fun reading through some of his wonderful books, but we decided to focus on Henri, Egg Artiste. Henri is a professional Easter egg painter … but he has grown bored of decorating the eggs similarly year after year. Then, late at night, Henri was struck with inspiration and created a masterpiece! His wife and friend, Marty Mole, are bewildered but the change in style – but they are supportive none the less. Henri continued to create a collection of truly “original’ eggs for Easter. 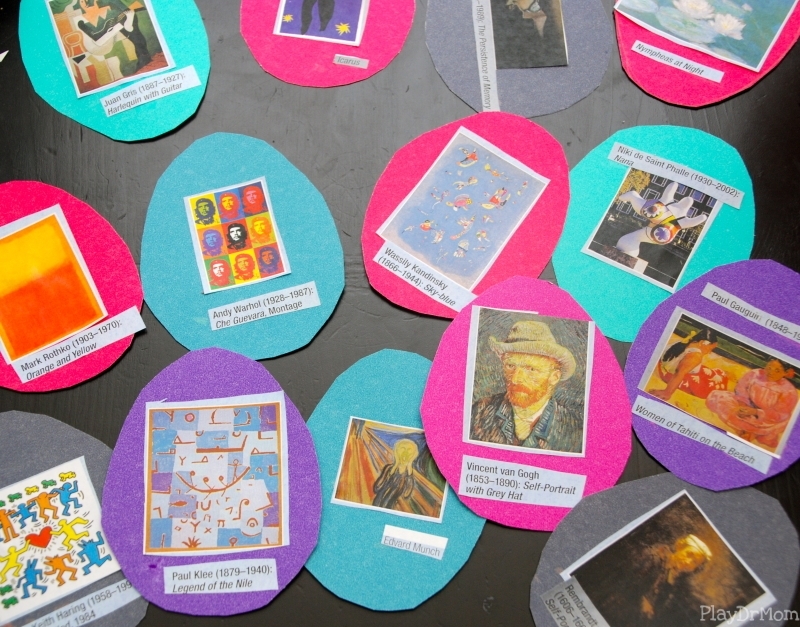 Each of Henri’s eggs copy the style of a famous piece of art; this allows for some wonderful art appreciation learning with the book. After reading the book with my kids, we went back through to identify which artist and work of art Henri was copying. And then I created a fun art appreciation game to continue our learning about famous works of art. I copied the pages of the book that had Henri’s eggs – as well as the back flap of the book where all of the original art pieces and artists are listed. After cutting the eggs out, I glued them onto card stock that I had cut into the shape of an egg. Then we had a deck of 30 egg cards (15 with Henri’s eggs and 15 with the original art work). I laid all of the egg cards with Henri’s eggs on them out and had my 4 year old daughter match up the original work. This simple game gave us another opportunity to discuss the art and the artists. She enjoyed noticing the similarities in the style and colors used … as well as the main difference of most pieces turning into bunnies! After this game she wanted to go on an Easter egg hunt! So, I hid the eggs throughout the house for her to find. Another fun use for the egg cards! Some other ideas I thought of for the cards are playing a memory game by placing all 30 egg cards face down and take turns flipping 2 cards over at a time to find the match of Henri’s egg and the original art piece. 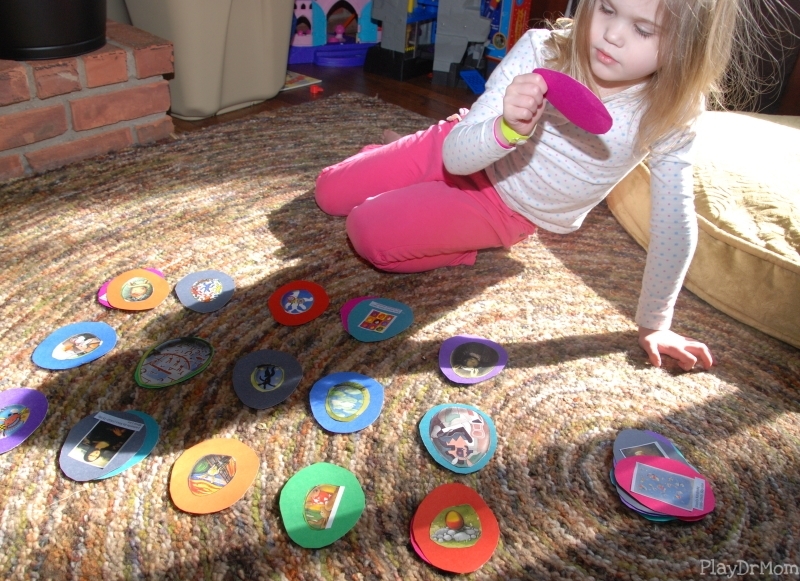 You could also play a version of Go Fish or simply use the Henri’s eggs cards as flash cards. This sounds like a great book and I love this activity to go with it. I will have to check it out. We’ve never read this book! It looks like a cute one and a great way to start discussions about great artists. Thanks for sharing at the After School Link Up.